I also tried a mole sauce (tomato, chilli, chocolate) for the first time. It was alright, but not great. I think that probably needed some sweetness too. Something I didn't like were the butternut squash noodles I bought from Tesco. Tesco have brought in a whole range of spiralized vegetables, and while I find it hard to justify buying spiralized carrot or zucchini (courgette), I gave in to butternut squash. I shouldn't have; I don't think it's a vegetable that works well in spirazlied form! It was hard to flavour it sufficiently and I didn't like the texture. More positive are my ongoing love affairs with oat cakes, Alpro coconut-soya and almond-soya yoghurts, and frozen berries. I'm still loving Choc Shot chocolate sauce too (including on yoghurt and berries...). Not food-related but visible from my kitchen are new floors. When we bought the house, I wanted to swap the old lino covering in the living room and the red carpet across quite a few rooms. This month we finally did it. The living room now has higher quality wood-look lino boards, and the carpet is a more neutral cream. It was a messy process, but I love the end result. Not yet featuring in my kitchen are Christmas-themed goods - but I sense they may appear any day now. I'm looking forward to it! Yes and yes to pineapple chocolate chip loaf!!! Love your new floors. 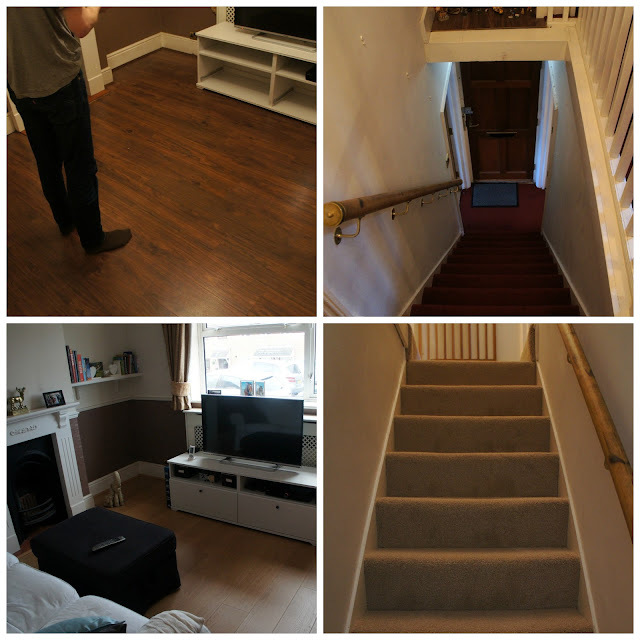 It's amazing what a difference new flooring can make to a room. Poor Mr Bite. I'm sure Mr Fork feels for him. Mr Fork often puts up with my cooking ideas too, some of which don't work out very well but he will always try them for me. I personally love the sound of the pineapple chocolate loaf. Your floors look fabulous! It does make a big change to the feel of the rooms. Spaghetti squash is hard to get in the UK too but I have had it once in the US and it is great! Very different to the spiralized butternut squash. You are doing very well with Christmas preparations! I also think the pineapple loaf sounds good. I LOVE mole. I have never liked it when I have had it in the UK, but every time I had it in Mexico I really enjoyed it. The pineapple chocolate loaf sounds like it would be delicious. I have not seen spiralized butternut squash in the stores here in the States. I keep saying I want to get a spiralizer but haven't yet. Until then I just use the mandoline to cut my zucchini into thin strips or use spaghetti squash. I haven't had a chance to start with Christmas either. The tree is up and then I got sick so it's going to take a little longer. Happy Holidays! I hope you're feeling better now and happy holidays to you too! I'm glad it's not just me who isn't smitten with mole! Oooh pineapple chocolate chip? That sounds like a lovely combo that I have not yet tried. And I love mole sauce - give it another try. Maybe try a different recipe? A different recipe is a good idea :-) And thank you!